Lafco Holiday Candles Are In! As the nights grow ever long, we watch in delight as our city slowly dresses itself in the twinkling, shimmering, sparkling lights that mark the coming season. In our homes, we love the magic of light, too. To share the winter evenings with beloved friends and family, celebrating our lives by candlelight, is one of life’s greatest pleasures. 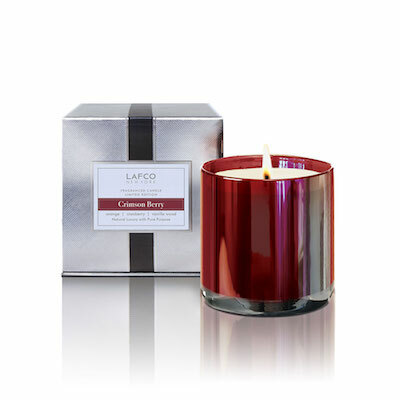 The luxurious holiday candles by Lafco create a warm and welcoming environment for our gatherings. And those aromas! Lafco’s scents are evocative, transporting us to different times and places. The qualities of the fragrances evade description, so please – stop by the Showroom, and experience them in person. You are sure to be captivated. The candles also make enchanting and very welcome gifts. The wax is poured into hand-blown art glass, which can enjoy a second life as a striking container when the candle has burned down. Tasteful, unique, useful, and very beautiful. Who would not want a Lafco candle? Crimson Berry, in a gorgeous red vessel, was inspired by the shimmering reds of the season’s berries. It is layered with crisp notes of lemon, orange, and cranberry, the sweetness of raspberries, and mellowed with undertones of eucalyptus and sweet vanilla. Winter Balsam evokes the very essence of a forest in winter. In the exhilarating fragrance drift notes of fir, sandalwood, eucalyptus, cedar, and amber. The rich green of the vessel glows warm and inviting. Feu de Bois (limited edition) conjures a roaring fire on a snowy evening after a long day out in the crystal air. The complex fragrance, of frankincense, sandalwood, leather, and pine, relaxes the senses. Starry Night honors the dark winter skies that shimmer with stars. The beautiful and soft fragrance floats with notes of bright fruit, rose and jasmine, and comforting wood.